showing, handling, and grooming for many years - and with a variety of dog breeds, including Irish Wolfhounds, Airedales, Puli. Shetland Sheepdogs, and more recently "designer dogs." Are there such people as "Dog Whisperers"? We’re not certain, but if its possible, the family at West Valley may come close. We know, believe we understand, and care deeply for our canine and feline guests. Kevin, Gary, Arleen and Sue will be spending time, and caring for your family member just as you would expect us to. 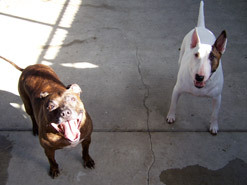 Many of our guests and their families come to us because of referrals from other guests at our kennel. They have been very happy with our family and our care, and we feel certain you will be pleased as well. We look forward to your visit!